World Cup Soccer Slots Review, Slots Symbols of Referees - SlotsSymbols.com - Kick the ball in the World Cup Soccer Slots! Kick the ball in the World Cup Soccer Slots! Maybe nobody knows the most watched game as well as soccer. Thousands of fans throughout the world are united by the habit of observing it either in the stadiums oron the sofa at home. The matches are waited by the men almost every week, but only the trickiest players know how to outwit the schedule and plus to take part in these competitions. They are gamblers who are aware for sure where the adored world cup soccer slots are! Who will get the World Cup of the soccer slots? Definitely you! But try to get used a little bit to this kind of slot type. Because it's so easy! It only has traditional 3 reels (at once you remember the slot machines history, don't you?) and also only the 1 pay line. And this situation will give only more of the winnings opportunities, you'll see! Imagine that you only throw one coin up to 5$ and can receive the complete jackpot of 12,500$. Ah, how sweet! As always before playing you have to get acquainted a little bit with the general rules and symbols that will appear there in a random way. Which of them do you need a lot? Let's see. There are Footballs, Referees and different Trophies that can be bronze, silver or golden ones. Which trophy do you dream about? It's not beyond the reality to get it. 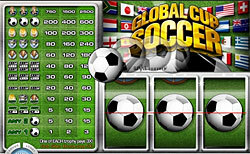 Besides, you can have the payout from the 12th winnings combinations from these mega interesting soccer slot games. While playing this gambling game you also have an opportunity to come back to the origin of the slots, and use the Bar Icons that can be single, double and triple. When you have the triple bar symbol - you win 60 coins, double bar symbols your winnings multiply in 120 coins. In general everything depends on the amount of bet coins. The amount of three coins means that you will have the one football on the reel. But to have the two footballs is not so cheap - you will have to throw 15 coins. To have three random combinations of trophies is to have luck, because they can win 3 times due to their done bet. To encounter these trophies one at a time means to have the possibility to win their bet 5 times. Do you want to get 200 coins? Please, just meet three soccer balls, having wagered the bet of one coin. It's nice, indeed. What is more pleasant is to receive 600 coins just having thrown the triple bet. Also try to find as much as possible symbols of referees on the one pay line, thus you will have the chance to hit with the one coin even 750 winning prize. Now, do you realize how does it work? Just keep on multiplying your pay outs and you will never forget the felling of scoring and the world cup is yours!